Passage: Proverbs 1:23: “I have called and you refused, have stretched out my hand and no one heeded..."
We have it covered from A to Z this morning. 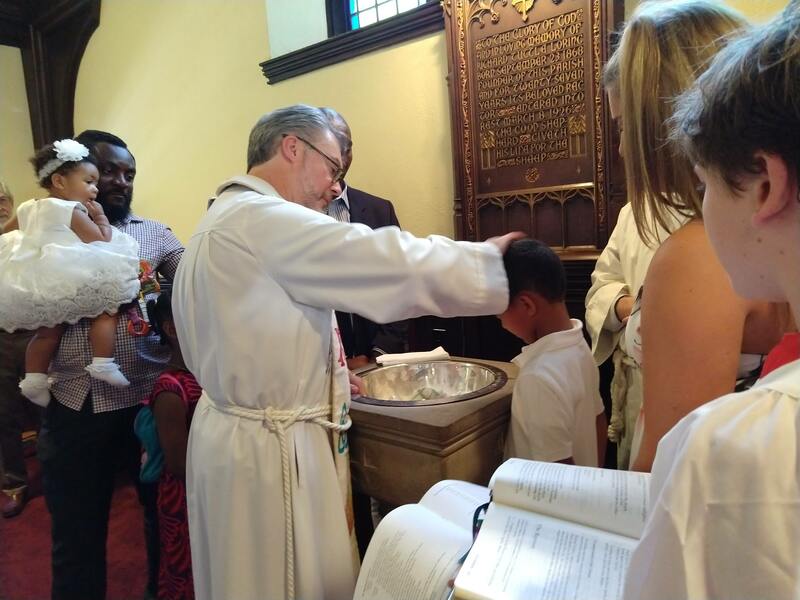 We have two candidates for baptism this morning, Amara and Zayden, who are siblings, and between them they encompass the whole alphabet of possibilities. Amara is not yet one, and Zayden is five, and we are incredibly pleased to have them here today. They get to start out their journey of faith right here, and we get to be the place where there life in the fellowship of the church begins. And then—you know what’s going to happen? Well, now, I would like to tell you that the Holy Spirit is going to come upon them and magically turn them both into angels who will always do the right thing and always obey their parents. Every parent here has probably secretly held that wish as they brought their child into the church. So let’s just deal with the bad news up front: That is not going to happen. Not here, no way, no how. Zayden and Amara are going to be our new brothers and sisters in Christ, but they are still going to be young people with minds of their own. But that’s really the whole point of what we do today. Yes, we’re bringing them into a community of people who try to live their lives the way disciples are expected to. That’s who we are—people who try every day to love God with our whole heart and mind and strength, and to love our neighbors as ourselves. And because we know we can’t manage to do that very well all by ourselves, because we know we need encouragement to keep on that path, we make a practice of showing up here on Sunday mornings to be accountable to God by being accountable to each other. That’s what this is about. That’s what Amara and Zayden get today; they get to be a part of that. But they get one thing more. If we can’t guarantee that their baptism will make them sweet and smiling all the time, we can guarantee them this: baptism gives us all a road back to God when we’ve wandered off. And we are really good at wandering off. Amara and Zayden have parents and now godparents who will surround them with wisdom as they grow up. Their parents will try to guide them in the right path, to teach them what it means to live with integrity, how important it is to make good choices in life. And you know what? They won’t always listen. We know this, because neither did we. The beautiful language of the Book of Proverbs puts this out there in front of us in poetic verses. The problem is not that no one has ever shared God’s wisdom, God’s hope, God’s plan with us. The problem is not that we have somehow been deprived of being taught of the difference between good choices and bad choices, between right and wrong. No, we’ve been taught that over and over and over again. And still we didn’t listen. And then, sure enough, our lives are about as put together as a dropped pie on the kitchen floor. And maybe we feel as though we missed our chance to be a good person, to be on the Jesus team, to be a saint. Here is the good news of today, and oh, my gosh, it is the best news ever: Baptism never made anyone a saint. All baptism does is give a lifeboat to those of us who get capsized again and again by sin. None of this makes any sense, not the faith, not the creeds, not the community, not the teachings, and not the cross—none of this makes any sense unless you spend at least a little time reflecting on what a struggle this life of ours is choosing between right and wrong, how hard it is to love our neighbors as we love, really love, ourselves. We miss so many opportunities to show compassion in the world. We make so many little judgments, unfounded, even unconscious judgments, of others. We give ourselves all sorts of wonderful, well-thought-out reasons to do things that we look back on and realize were self-deceptions, not holy hopes. Baptism doesn’t change any of that in us. If it did, the cross would never have been necessary. We are born with this perplexing, unending combination of great possibility for good and stubborn tendency for...not so good. Just because God keeps telling us over and over again the simple truth about ourselves doesn’t mean we listen. What baptism does change in us—what will be changed in Zayden and Amara forever—is the conversation we get to have with God about all of this. Before, we are outside a closed door, not yet invited in. After, we are welcomed in, seated on a throne, and made inheritors of the kingdom—and given the opportunity, if we will just take it, to admit it when we’ve messed up, no matter how many times we do, and get back in relationship with God and with God’s people.